A sport seat cushion will make watching games more comfortable. Sport Seat, stadium cushions or bleacher seat cushions are basically the same whatever you call them. These are used to make hard wooden or metal benches more comfortable when watching your favourite games. The ones you can buy in many shops and on line can also have backs and arms as well, but these can be easily made if you want a softer seat to sit on. 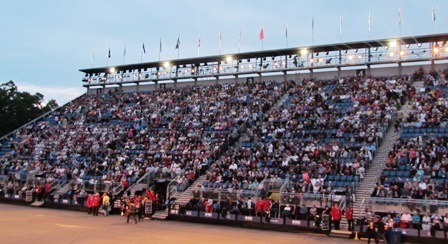 When I went to see the Royal Military Tattoo in Edinburgh I decided to hire a cushion as from previous experience the seats were hard and you are sitting there quite a long time. In the end I wished I hadn't bothered as the supposed cushion was harder than the newly upgraded seating stand, it ended up on the floor in the end. The purpose of this type of seat is to make you comfortable so basically any type of cushion will suffice but a boxed cushion will give a little extra support. The filling for these is usually a foam block . The outer casing should fit tight over the block and an envelope or overlap opening works well. Decide on the size of seat you are going to make, in this example a 12ins x 12ins x 2ins ( 30.5cms x 30.5cms x 5cms) square was used. 2 x 12 ins by 8 ins with raw edge turned under on opening side. 1 x 48 ins by 2 ins for the continuous strip gusset. Matching ribbon or tie fastening for carry handle (optional). Take full size square and with right sides together pin continuous strip along the edges. The seam can either be in middle of an edge or in a corner. Sew, Trim seams. A carry handle can be added in needed by sewing a piece of matching ribbon or making a long tie fastening securing into place by sewing the ends in between the remaining back and gusset. Take other side of overlap piece and sew into place, right sides together so the edges overlap. A sport seat has been made for you to enjoy if you wanted a back then you could make two and join them together.